From the cloud-capped Andes to the humid Amazon basin, Peru is the quintessential Latin American destination rich in history, culture, adventure and wildlife. The citadel of Machu Picchu is one of the world’s most iconic archaeological sites, its narrow terraces clinging spectacularly to a mountain ridge. Nearby, the ancient Inca capital Cusco reveals its fascinating past in layers - terracotta-roofed colonial houses built on the foundations of previous civilisations. An arid coastal plain stretches along the entire Pacific coast, highlighting archaeological gems such as the vast ruined city of Chan Chan, the tomb of the Lord of Sipán, and the mysterious Nasca lines etched in the southern desert. Peruvian culture is a heady mix of influences. Indigenous people trade crafts and textiles in busy markets and celebrate festivals with music and dancing. Quechua or Aymara are spoken alongside Spanish, and gastronomy is a delicious fusion typified by ceviche accompanied by a pisco sour. If you have a taste for adventure, try river rafting in a canyon with condors soaring overhead; trekking or biking along remote mountain trails; or sailing on the world’s highest navigable lake, Titicaca. Or travel by boat to remote rainforest lodges in search of giant otters, shimmering birds and butterflies and the secretive jaguar. 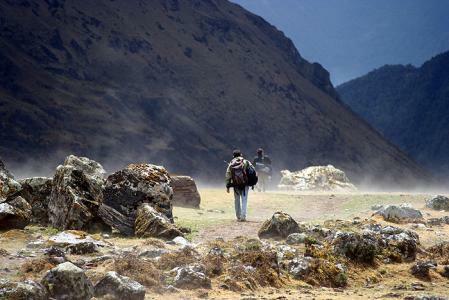 Peru is a wonderful country for the adventurous and the Sacred Valley and Cusco are a great base for activities. 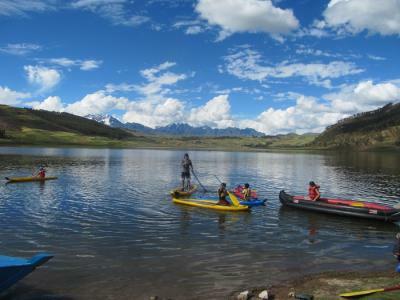 Try stand-up paddle boarding on Laguna Huaypo, rafting on the roaring Urubamba river or even mountain biking past the salt flats at Maras. The Inca, despite their other successes, never discovered the wheel, but maybe they didn't need it, as Peru is made for walking. Criss-crossed with trails along remote mountain paths to traditional villages and through spectacular valleys, possibilities abound. 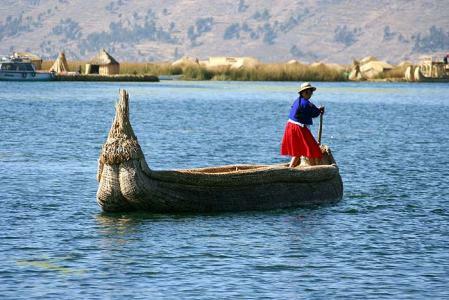 The highest navigable lake in the world, Lake Titicaca is the mythical birthplace of the first Incas, Manco Capac and his sister Mama Ocllo. Centuries ago, the local Uros people began building floating reed islands on the lake and many still live on them today. 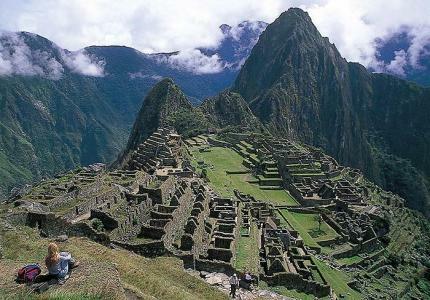 The ancient Inca citadel of Machu Picchu is one of the world's most iconic archeological sites. With its narrow terraces clinging spectacularly to a mountain ridge high above the winding Urumbamba river, it really is an awe-inspiring site. 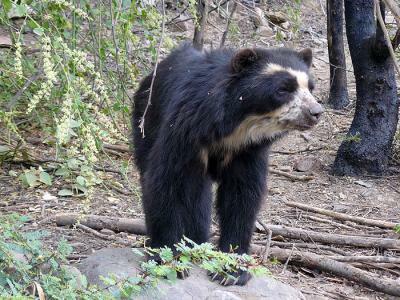 The spectacled bear is South America's only surviving native bear. They are mainly herbivorous (including Aunt Lucy's predeliction for marmalade) and live in the humid cloud forests of the western Andes. Peru has several projects to protect the species, threatened by habitat loss. We would like to thank you so much for making our honeymoon the trip of a lifetime. You immediately understood the balance we were looking for between the luxuries we wanted on our honeymoon and our desire to explore South America. Even though I thought I knew what to expect (I kept it a surprise until we checked in at Heathrow) it was better than I could ever have imagined. Everything ran so smoothly, it was so nice to be met everywhere by friendly and informative reps who knew exactly what was happening, not just with their responsibilities but coordinating with each other so that the whole thing was seamless. I can be a bit of a control freak but quickly realized there was nothing to do but relax and let the holiday unfold..
April to October is the dry season in the mountains, with hot days and cold nights, and is the best time to visit, especially if you are hiking. In the Amazon it is humid and hot year-round, with particularly frequent rainfall between November and April. On the coast summer lasts from December to April with hot dry conditions and temperatures between 25 and 35°C. Between May and November the southern coast suffers from the garua, a blanket of sea-mist. Yellow fever recommended, particularly if you are going to the Amazon, or leaving Peru for some other countries (e.g. Brazil). Anti-malarials are necessary if visiting the jungle. You should be up-to-date on tetanus, typhoid and polio. Not required for most nationalities for 90 day stays. The currency is the Nuevo Sol (S/. ), with 100 centimos to one Nuevo Sol. Notes come in denominations of 100, 50, 20 and 10. It is recommended to bring either US Dollars or dollar denomination travellers cheques to change, although in remoter areas it can be hard to find places willing to accept or change travellers' cheques. Keep official exchange slips as without them you will be unable to change soles back into dollars. Visa credit cards are generally widely accepted in the larger towns, followed by American Express. MasterCard is not as commonly accepted as most of the others. Cash can be withdrawn with your Visa card with no commission from the Banco de Crédito. The now privatised state telephone company, Telefonica del Perú, has offices in all towns of any size. Local calls are cheap and international ones rather expensive. Always check prices before using the telephone at hotels, as they often mark up international and long-distance calls considerably. Phone cards (tarjetas) are available, which can be used at many public phone boxes, most of which are capable of making international calls. Email is available in all towns, especially in Arequipa, Cusco and Puno. Official language is Spanish, but Quechua, the ‘Inca’ language is widely spoken in the Andes, often exclusively particularly by the older generations. Aymara is also important around Lake Titicaca. In the larger cities you will find people who speak English, but not in remoter parts. Any effort to learn or brush up on your Spanish will be repaid many times over. Most Peruvians are Roman Catholics, although pre-Colombian traditions co-exist in many areas.